Breeders in Japan today all strive to grow Jumbo koi, which means large, high quality koi that are over 80cm (31 inches) in length. In order to accomplish this goal, the parent koi must be of exceptional size and quality, and the growing conditions for the offspring must be optimum. 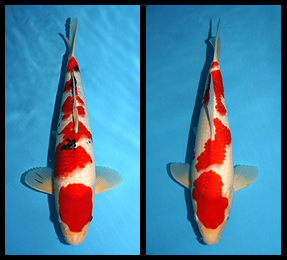 The young koi are selected for their quality and beauty, but above all, for their propensity to grow into Jumbo koi. These potential Jumbo koi are typically spawned in early May and then reared in low densities in mud ponds until September, when they are brought indoors into heated greenhouses to be grown on until early spring. By this time the Tosai, which translates as koi of less than a year old, have gone through ten to twelve cullings, a selection process that is designed to leave only the most desirable koi with the greatest growth potential. These remaining koi are known as Jumbo Tosai. Pan Intercorp is proud to be able to offer a variety of Jumbo Tosai from the world's leading breeder, Sakai of Hiroshima. A number of these Jumbo Tosai are still in Japan, guaranteed female*, and eligible to be boarded in Japan* with the breeder for the 2005 growing season. Click here to view some of these Jumbo Tosai. *Call 1 800 827 5819 for details on "guaranteed female" and "boarding koi in Japan"